Tomorrow, a number of internet companies and net neutrality interest groups are participating in a highly publicized “Day of Action”. This was organized in reaction to the FCC proceeding that proposes to reverse the former FCC’s decision to impose heavy internet regulations (Title II) on network providers and return to the highly successful light-touch regulatory structure (Title I) that governed the internet for decades. In the opinion of the Day of Action organizers, reversing Title II threatens the net neutrality principles that today govern the internet; namely, that internet providers cannot block, throttle, or unfairly prioritize content that they carry over their networks. To be clear though, Title II and net neutrality are not even remotely the same thing. Title II is a complicated set of rules from the 1930’s meant to govern an era when rotary dial telephones were in vogue. It has as much relevance to the internet as a horse and buggy has to an airplane. But the Day of Action isn’t designed to educate consumers about sensible policies, rather its goal is to scare them into thinking their internet experience will somehow suddenly be degraded if the FCC restores light touch regulation. Don’t believe the hype. That is why we are emphatically restating what we have been saying for nearly a decade: we agree that internet users should have the freedom to go anywhere on the internet or to run any application with confidence that internet traffic will in no way be blocked or throttled. That idea sits at the foundation of internet services, reflects how consumers enjoy the internet today, and despite claims to the contrary, has never truly been in jeopardy. And, as witnesses to 15 years of back and forth at the FCC over this issue, it’s clear that the only way to have strong and sustainable net neutrality protections is through an act of Congress, not through policy preferences that can change with each new Administration. While we can spend a lifetime debating the merits and risks of any internet policy, we can surely agree that when pen comes to paper, net neutrality rules should be clear, consistent, permanent, legally enforceable, and free from unnecessary, counterproductive red tape as is the case with Title II. The cable industry is proud to be America’s largest residential broadband internet provider and we’ve always embraced and delivered a truly open internet experience for consumers. That is why the images of slow loading web pages that tech activists are posting around the Internet are a false prophecy. ISPs have consistently increased speeds for decades and have announced even more dramatic speed increases in the coming years. Speed is our best selling point. The only thing that will slow down one’s internet experience is if overregulation robs Internet builders of the incentives to pour more investment into the network. It is preposterous to think that there is a profitable and winning business strategy for ISPs to intentionally degrade their customers’ internet experience. Years ago, our industry found a successful business model centered around giving consumers fast, full and open Internet access. That will not change. Why? Because it’s what consumers demand and what makes our business grow and thrive. It’s really that simple. 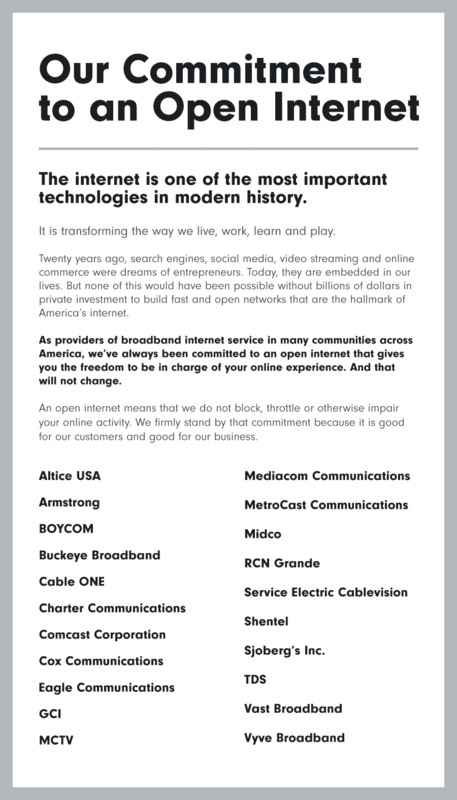 To punctuate this commitment, in May we placed a full-page ad in the Washington Post to reaffirm our strong commitment to an open internet, and to continue delivering a fast and vibrant online experience to consumers. The ad was undersigned by cable ISPs large and small who operate in nearly every community across America, in big cities and small towns, from dense suburbs to lightly populated farming communities.